My Mom and I made Twisted Cookies for the first time in 1959 from a recipe printed on the inside of a cake yeast wrapper. My Mom made bread from scratch, without a recipe, and this tricky and unique recipe using yeast was right up her alley. When I left home and married, this recipe went right along with me. You might say I have been leaving a trail of Twisted Cookies behind me for the last 48 years. This is our family cookie and I only make them at Christmas time. If I ask my older son (age 42) what he wants for Christmas, he always says, “You know what I want, Mom.” And my older daughter and grand daughter have taken up the baton and are making their own Twisted Cookies now, carrying on the tradition. In fact, originally I was going to call my blog Twisted Cookie. I even have a photo file on my computer called Twisted Cookie pics that I took in anticipation of my blog launch. I looked online to see if the domain name was free and it was! The next day I went to purchase it and someone had bought it and was offering it for sale for $16,000. I was furious and I cried. I had never thought of calling my blog anything else, so I had no Plan B. My blog was ready to launch and had no name. It took me 6 months to come up with a new blog name I felt I could live with. But that is a story for another post. 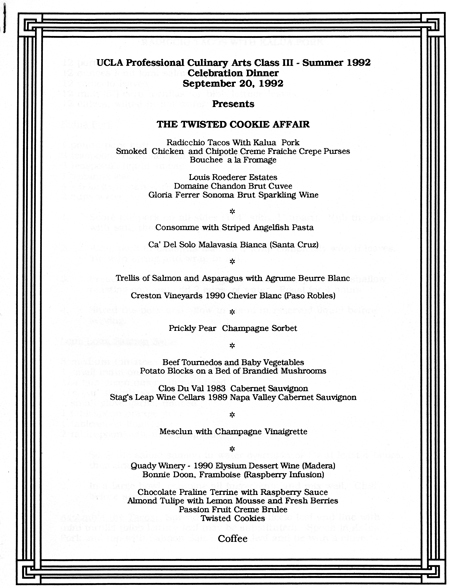 In 1992 I took my third hands-on cooking class in culinary school at UCLA. At the end of the quarter, we prepared a banquet for about 100 friends and relatives. It was held at historic Castle Green in Pasadena. If you go to their website and look at photos 10-12 in the gallery, you will see the gorgeous dining room we were so lucky to use. During the quarter, all the students brought different dishes we thought might go on the menu, and one of mine was my Twisted Cookies. They liked them so much, they decided to call our event The Twisted Cookie Affair. The other recipes that were mine were the Potato Blocks and the Chocolate Praline Terrine, both of which may appear on this blog at some point. In retrospect, I cannot fathom why the potatoes were given such a pedestrian title. Couldn’t we have called them Potatoes Lynnaise or something. Lol. Oh well, I was younger then. I have already told the story of my second culinary school banquet in 1995 in my post titled Mini Lemon Tartlets and a Culinary School Banquet, which you can read here. That was the class where I had to seduce the other students into using my recipes, one of which was my Twisted Cookies. 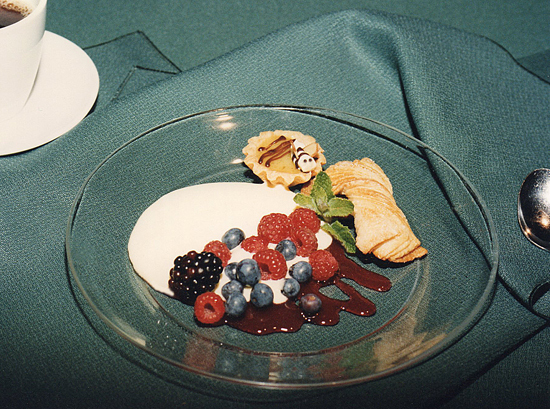 You can see one on the plate above at that banquet sitting proudly with the Mini Lemon Tart, Sabayon and Berries. After the dough is made, it is divided in two, wrapped in plastic and refrigerated. The dough is rolled out over half the vanilla sugar and the excess around the edges is scooped up and rolled in on top. 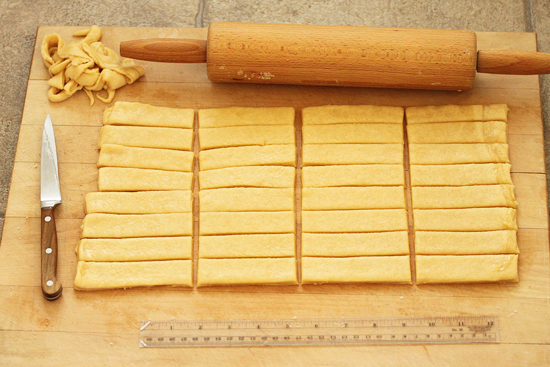 The dough is folded in thirds and rolled out, and folded and rolled two more times. The edges are trimmed to form a neat rectangle. The dough is sliced in half, and each half divided in two. Just eyeball it. Each of the four slices is divided in two to form 8 1-inch strips. The cutting board is turned so the long side is facing you and the strips are cut in half, and each half divided in two to form 32 4x1-inch strips. Each strip is twisted 2 times and placed on an ungreased foil-covered sheet. They are baked to a golden brown and the sugar on the bottom caramelizes. 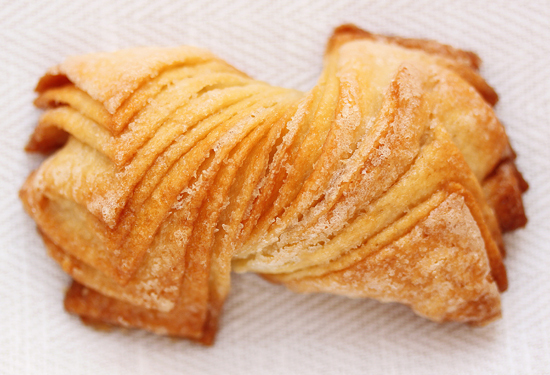 The sugary top is crispy, and the yeasty pastry dough inside is soft and layered. I bet you have never had anything like this. Preheat the oven to 375 degrees F. Line 1 cookie sheet with foil. Double pan to bake. 1. In a warm medium bowl, combine water, yeast and sugar. Proof until frothy, about 10 minutes. 2. In a separate large bowl, mix together the flour and salt. 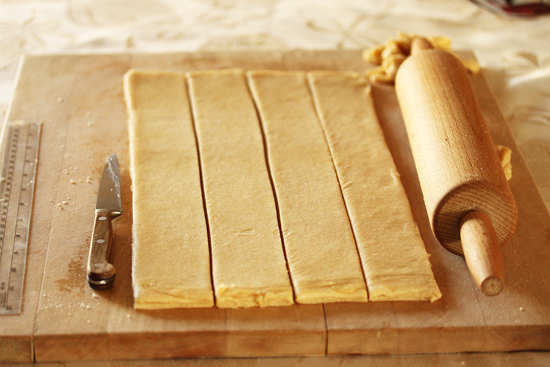 Cut butter into flour until rice-size with two knives or pastry cutter. 3. In the medium bowl, mix eggs, sour cream and vanilla into the yeast mixture. Pour the egg mixture into the large bowl with the flour. Stir thoroughly with a fork to make a dough. 4. 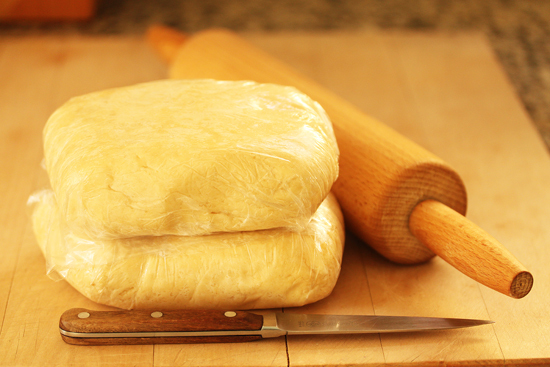 Divide the dough into 2 patties, wrap each in plastic, and refrigerate a minimum of 4 hours or overnight. Place patties side by side, not stacked to assure even cooling. My patties were 18.5 oz each. 5. In a medium bowl, thoroughly mix together the sugar and vanilla until evenly distributed. Cover the bowl with a plate or plastic wrap so the sugar doesn’t dry out. 6. On a dry surface, place ½ of the vanilla sugar. Place one patty of dough on the vanilla sugar (leaving the other patty in the refrigerator) and roll into a 16 x 8-inch rectangle. Scoop up all the sugar from around the edges and spread evenly over top of dough. 7. With the long edge toward you, fold both edges toward the center, making 3 equal layers. Turn one quarter around and roll into a 16 x 8-inch rectangle. Scoop up any extra sugar and smooth onto the dough. Do not discard any of the vanilla sugar. Use it all. 8. Fold and roll into a 16 x 8-inch rectangle 2 more times. The dough should be about 1/4-inch thick. 9. Trim the edges slightly with a sharp knife to as perfect a rectangle as possible. 10. 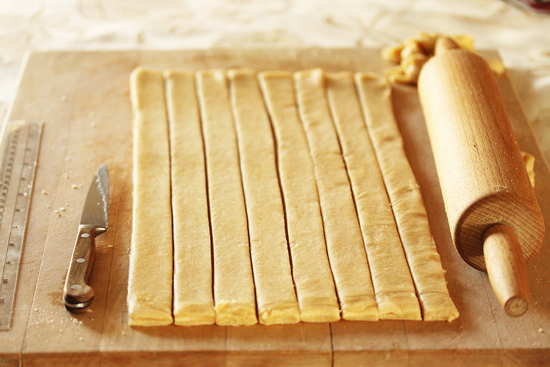 With the knife, cut the dough the long way into eight 1-inch wide strips. Cut each 16 x 1-inch strip into 4 equal pieces, each 4 inches long. 11. Twist half (16) of the 4 x 1-inch strips 2 times, over-twisting to stretch the dough in the middle. Place on an ungreased cookie sheet. 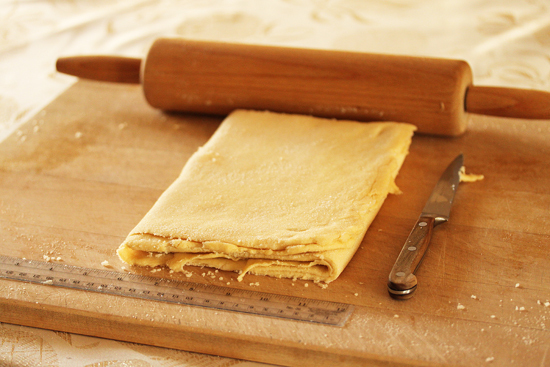 Make sure the dough twist lies flat on the sheet. You may need to fan out the layers on the ends somewhat to make sure each is touching the sheet. Press down a little to help it adhere. 12. Double pan. Bake at 375 degrees F, 15 – 20 minutes or until a rich golden brown. With a spatula, remove from sheet immediately before the caramelized sugar hardens and sticks to the foil. Cool on a rack. 13. Discard foil on cookie sheet and replace with new foil. Repeat with remaining 16 dough strips. 14. Start over with the second dough ball and remaining half of sugar. Note: Store in airtight container at room temperature for 3 days. Freeze in ziplock freezer bag for 2 weeks. Defrost at room temperature with top of bag unzipped, so that moisture can evaporate and not melt sugar or make cookies soggy. When room temperature is achieved, re-zip bag. PS. My heart broke for you when I read about how you intended to name your blog The Twisted Cookie. I am going to try making these today. Has anyone ever tried replacing the vanilla sugar mixture with cinnamon sugar? I’m thinking i may make half the batch cinnamon and half vanilla. Wow, my daughter was on pinterest and emails me the picture of your twisted cookies and says aren’t these grandmas? My mom has made these my entire life. She found the recipe in a yeast packet, too and it has always been her specialty. My niece has the technique now, but I find them too time consuming for my patience! It was fun to see the happiness these wonderful cookies brought to your family, also. These are delicious! They are a little time-consuming, but your instructions were PERFECT. Very easy to follow! I finally made these cookies but they are nothing close to yours.. See my link http://www.devri-alem.com/mayali-kurabiye/ Could you please tell me what I possibly could have done wrong? Well sure there are a lot of differences in ingredients.. As I live in Turkey I couldn`t find sour cream for example and used the usual cream here in Turkey.. Whatever! It tasted great and thank you very much for this recipe.. I certainly will give it shot again..
I’ve been looking for a reason to make these, and as I can’t find one, I’m going to make them anyway. I have no need for so many, though, and not enough freezer space to store them. How do you feel about halving the ingredients? This looks like a recipe my mom made when I was a kid in the 1950’s and 60’s. I found her recipe in a Pillsbury bake off cookbook–the kind you find at the grocery store checkout–it was marked 25 cents! Anyway the cookies are called Starlight Sugar Crisps. In this recipe there isn’t any sugar in the dough but the other ingredients look about the same. It has always been my favorite cookie. Lynne, What a lovely lady you are, and what a wonderful memory this blog, and recipe brings back. My mother made these on every Christmas also. We called them Starlight SugarCrisps. They are DEVINE! You have been making them for 48 years, I was born in 1948. anyway, what a blessing to see the lovely tantalizing photo of these cookies. Iam not much of a baker. I do art, but may try this this Christmas or request my baker sister to make them:) Thank you. Oh, wow, thank you for this! My mom used to make these and we called them German Sour Cream Twists, but they were actually little knots, I believe….kinda like a pretzel. I LOVE the taste of these and have always wanted to make them. My mom tried to tell me how, but your step by step instructions are so much better! Thanks so much! Next time I’m off the diet, these are on my ‘fat list’, LOL! Lynne (and Lynn) I can repeat your stories as well..It was around 1959 my mom began making these and we call them Starlights as well. I make them every Christmas too! A few shortcuts I have used are making the dough in the food processor. Usually I make up a few batches and wrap them and put them in the fridge till I am ready to roll them out. I have found they will begin to ferment after a few weeks and that makes them tastier. I’ve never known anyone else to make these. First, thanks for this great recipe! These are like the cookies we used to buy from the bakery when I was a kid. I still remember the taste! Now I can bake them myself! Great! I made the dough last night and wanted to roll it today. 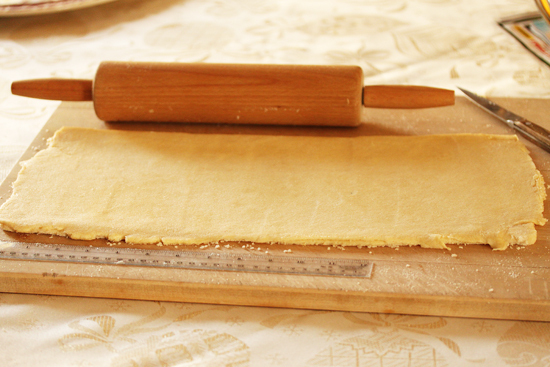 But, the dough was very sticky and it sticked to my surface and rolling pin and all my fingers! I put it back in the fridge for an hour, but still sticky. I added the sugar to the surface, but it did not work. Do you know what was the problem? I did exactly as you said, except that I added the yeast mixture to the butter/flour by mistake and then added the sour cream and egg to the batter. Do you think that this is the reason? Thanks Lynne for your quick and great response! I did all the things that you said. Maybe because it was my time cooking any kind of cookies, they did not turn out good! The only thing that I forgot to mention was that I used unsalted butter instead of the salted one. But I remembered to add more salt to the dough to make it up. As you said, I divided the dough in four parts and add more flour to my surface. I could just roll it one time. I cut them and put them in the oven. They did not look like your cookies, obviously! But they tasted great! Thank you! Well I made the whole batch today and the first twists from the first dough patty came out a little, uh, not-so-perfect. But I learned by the second patty and they looked great (yours are better!) and tasted great too! I look forward to adding these to my annual Christmas cookie trays – thanks again for all the info! These are my favorite holiday cookie! We have been making them for years and learned the recipe from my Great Grandmother. Mine don’t turn out as pretty, so i will be taking a closer look at your directions to see if I can make mine look better. For years I have searched for the recipe for cookies made with yeast which my Aunt made every year at Christmas.I have searched so many cook books, and so many cooking sites without any luck. I searched again last Christmas without success, so I really had no hope of finding it as I searched today – just decided to try again, when amazingly I found your blog and the recipe for the Twisted Cookies! I am so excited, and so thankful to you for posting it. My daughter and I will make them when she comes home for Christmas. 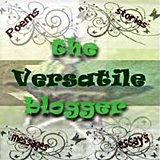 Love your blog and will be happy to share it with my daughter- she has introduced me to so many . Thanks for the wonderful gift! Nagyon finom lehet ez csavart sütemény,kicsit bonyolult,de azért megpróbálkozom vele!! !Eltettem a receptet a könyvtáramba!!!Köszönöm!!! 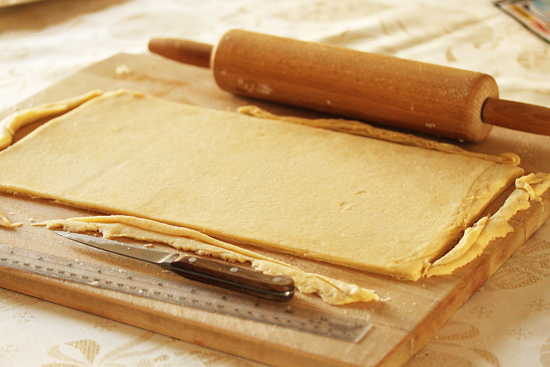 Hungarian tranlation: These delicious cookies can twist a bit difficult, but give it a spin! Put the recipe in my library! Thank you! any chance you could be talked into a youtube video the next time you make these beautiful looking cookies? I was brought to your blog by a picture of the Twisted Cookies on Pinterest. 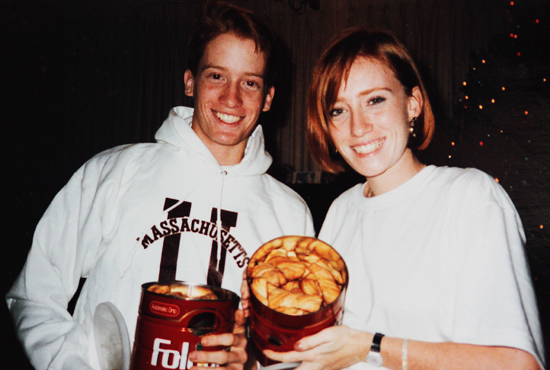 When I started reading the story of the cookies, I thought I was reading about my in-law family. 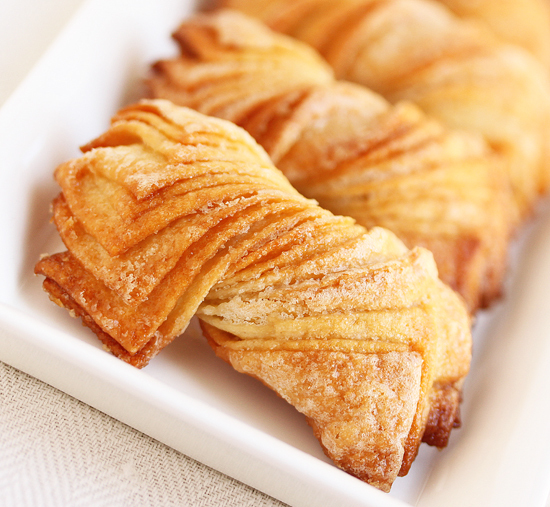 My husband’s mother has made what they call “Sugar Twists” since the kids were little – and only at Christmas, like your family. She had a terrible time hiding them away from her boys. One year, she found only empty cannisters when she looked for the cookies. She is in the first stages of Alzheimer’s now so her baking days are over. She and most of Dean’s family live in northern Minnesota, a good 5 hour drive from our home in the Twin Cities. Last year my sister-in-law brought her down to our home, where she spent the weekend baking, under the supervision and with the help of Dean and my sister. I’m in a wheelchair, so I’m not of much use, but I can peel and chop! Dean is hoping that she will be well enough to make the trip again this year, because he and his brother and sisters were all very happy to see Mom’s Sugar Twists one more time. Back to the Pinterest picture — I thought maybe you had come up with an easier method of making these great cookies, but it looks like the recipe is the same as ours. 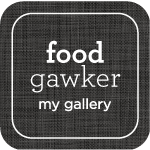 I’ll be following your blog from now on, and will read your archives for other good recipes. I want to try making these to bring to a friend on a out-of-country trip in 2 weeks and I have all the ingredients except the sour cream part. I just bought a tub of “Heluva Good French Onion Sour Cream” today. If I pick out the onion parts and only use the sour cream part, would it work? I have to omit the salt ingredient too cause the savory dip should have enough salt right? Also, the 1 tsp vanilla ingredient for the dough, is it vanilla extract? I’d like to know what you think before I start it. Thanks so much. I took your advice and bought some plain sour cream instead of using my french onion sour cream dip, good thing I did. My 1st attempt wasn’t as smooth sailing as I hoped because after rolling the vanilla sugar, the dough started to become soft so I placed the dough in the fridge to harden a bit. Wrong move. The sugar ended up liquidity which made rolling it out difficult and it started to rip. I couldn’t twist it like yours without it puffing out of shape but I did managed to savage it by trying to shape them into palmiers. They had many layers and tasted incredible. Since I knew what I did wrong, I just had to try it out again the next day but this time I didn’t put the dough in the fridge after rolling. It turned out quite well but I must work on the twisting part. I tried to press it down after twisting but some of them seemed stubborn and broke free so what worked best for me was to just fan them out. Is it because I baked them at 350 degrees in a conventional oven instead of 375? But 375 would burn the cookies too quickly on the outside before thoroughly baking inside. I will definitely makes these again, next time I’ll press these suckers really hard to make them stay from fanning out and hopefully after more practice they will eventually turn out as beautiful as yours. Thank you so much for sharing this great recipe. I tried these – and they turned out more like croissants than cookies. Maybe I have to roll the dough out thinner? They were very tasty, but were definitely more like pastries than cookies. Also, I used plain yogurt instead of sour cream because that was what I had on hand – I assumed it wouldn’t make a difference, but maybe it caused a slight difference in consistency of dough? My mom discovered this recipe in a Betty Crocker holiday recipe book and has been making these cookies for over 70 years! Hi Faria ~ I’m sorry, but you cannot use water instead of vanilla extract. The water would melt the sugar. You could use any other extract also, such as almond or lemon. Extracts are typically 40-80% alcohol, which does not melt the sugar. The dough also has vanilla extract in it, so maybe you could invest in some, and keep it on hand for this and other baking projects. The recipe calls for granulated sugar. This is so cool! 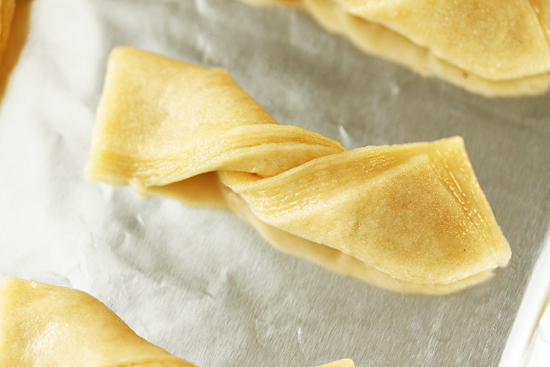 I love the look of your twisted cookies, how they fan out so beautifully. My grandma has made the same recipe since my dad was a little boy, and they are my family’s special Christmas cookie too, though we just call them twist cookies. For the past few years, my sister, mom, and I go to my grandmother’s house and we have a Christmas cookie party, where we each make a batch of twist cookies. My dad always comes over after he gets off work, just so he can have some hot cookies. It’s great to see another family with a similar tradition. I might have to change up the way I make them a little. We don’t cut the edges at the end, but I like how yours flare out. Thanks for posting this! Brings back great memories. I was looking for a pretty yeasted cookie and spotted your twists right away. My dough is sitting in the fridge waiting to be rolled tomorrow. Question is how many tri-folds total? 3 or 4? I tried to count your layers and I see 9, but I think the direction says to do it four times. I expect it’s really not that big a deal if the layers can maintain their integrity, but I’d love an answer, you know if you’re just sitting there waiting for questions. Thank you! Your work is terrific. Oh and a second question: Why foil and not parchment? Is that a throw back to the original recipe on the yeast packet, pre-baking parchment days? Have you tried it on parchment? Hi Lynne–I had a copy of the predecessor (>50 years old) of this recipe from my mom’s old Pillsbury Bake-Off cookbook, which varies in method (you only roll and fold once) and ingredients (calls for 1/2 shortening). Both Mom and I had made them and thought they had potential but were missing something. I wanted to experiment and improve on it and found your site. Your version turns this duckling into a swan! I’ve made a couple batches already this season and have a few observations. I used parchment and found it worked just fine, though I didn’t do a comparison batch with foil. Halving wasn’t a problem, either. I experimented with the sugar, too, mixing 1 Tbsp. cinnamon into the sugar/vanilla mixture, with good results. I couldn’t bear to discard the trimmings, so I used them to make a few “ugly” twists for my personal consumption. Fewer calories if they’re not perfect, right? Just wanted to say thank you for sharing your great recipes, especially the Twisted Cookies which are my new favorite cookie of all time!! I discovered your recipe before the holidays and included them on all my gift cookie trays. Can’t tell you how many more times I’ve made them since —even making them a little bigger for brunches and referring to them as a “pastry” given the beautiful rise and separation of dough similar to a french pastry. Anyhow, once more thank you again! I look forward to your updates on your blog! What a fun and delicious recipe!! I made them today for the Senior Café we have at our church–a huge hit! From now on, these are absolutely going to be keepers in my family as well. Thank you so much for sharing. PS: I also grew up in the Midwest in a Norwegian family–fun to hear of all the yummy Christmas treats that I don’t have here in Germany. Maybe I’ll have to try some Lefse and Sandbakkels this year…. How far in advance can you make the dough? If I made the dough on a Tuesday could I wait until Saturday to make the cookies? These look so delicious. 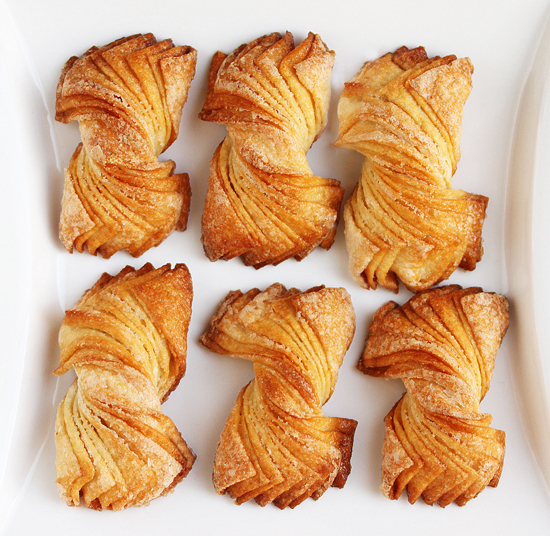 Do they taste like a palmier? Also, can I use instant yeast? Not rapid rise, but instant. Thanks so much! I started making these this morning, using my mother-in-law’s recipe. She was from Hungary, and called these Ice Kipfal. When I made them, I usually doubled the batch, as I had a huge family. I would put the twists all on their cookie sheets and just wait until I was done rolling to start putting them in the oven. So I had pans of twists sitting on table, chairs, etc. 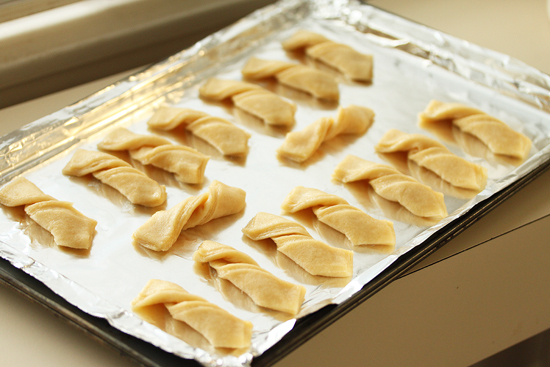 Once a young nephew, about 8 or so, was there and SAT on a pan of twists……..we sort of rescued them. When he was a young man, he asked me if I remembered when he sat in the twists! The ones I am making today will go to church on Sunday, to be served with coffee after services. Everyone loves them.